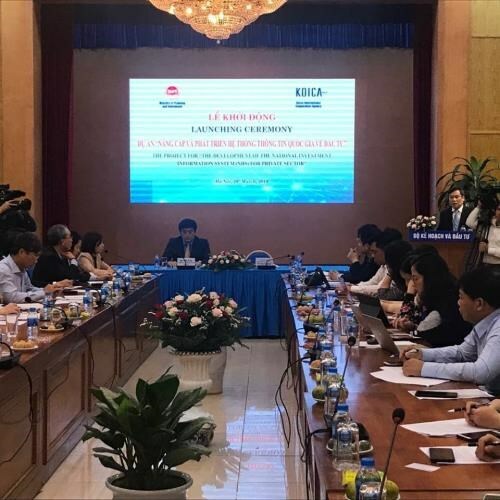 Hanoi (VNA) – The Ministry of Planning and Investment (MPI) and the Korean International Cooperation Agency (KOICA) organised a ceremony in Hanoi on March 28 to launch a project to develop the national investment information system (NIIS). MPI Deputy Minister Vu Dai Thang said the project will greatly contribute to building and implementing e-government, boosting administrative reform, making investment procedures more transparent, and facilitating foreign investors’ operations in Vietnam. He urged relevant ministries, agencies and localities to work closely with the MPI during the implementation of the project. Kim Jinoh, Country Director of KOICA in Vietnam, affirmed this is one of the priority projects in the realisation of the Republic of Korea (RoK)’s New Southern Policy, which considers Vietnam a key partner. The NIIS project has total investment of 6.2 million USD, of which 5.5 million USD will come from KOICA’s non-refundable aid. It was approved by the Vietnamese Prime Minister in June 2017 and a record of discussions for the project was signed in May 2018. It includes three components: consultancy, system building and project management. Implemented from now to 2021, the project will focus on supporting the MPI in upgrading the information system; strengthening the capacity of collecting, managing and analysing national databases on investment; providing online public services to investors and granting investment certificates as well as managing the project under operation. The system will be deployed on an integrated platform with other national information systems to improve the efficiency of information exploitation and database analysis to meet the requirements of users. The RoK is now Vietnam’s largest foreign direct investment (FDI) partner with nearly 64 billion USD in total registered capital. It is also the second largest tourism partner and the third biggest trade partner of the Southeast Asian nation.